For Gamescom , Milestone released a new video trailer of their Sebastien Loeb Rally Evo title. Sebastien Loeb Rally Evo will feature extensive offline- & online modes as well as a career mode. Players will be able to choose from a wide variety of cars from several decades of rally history that can be raced on 250 kilometers of GPS-based stages. The title will not only feature WRC-style rallying but also rally cross!Sebastien Loeb Rally Evo will be available both for the PC as well as Playstation 4 & Xbox One. Milestone recently announced that the tile has been pushed back to 2016 to allow for more development time on what Milestone describes as their biggest project to date. Milestone Studios have released new preview screenshots of the impressive lighting and road surface effects of their Sebastien Loeb Rally Evo title. The screenshots represent a selection of stages from the Rallye de France and also some snapshots of a French rallycross track. No further details have been given as of yet. Sébastien Loeb Rally Evo has been rescheduled for release early 2016 for the PC, PlayStation 4 and Xbox One. Milestone has released a new video trailer of their Sebastien Loeb Rally Evo title, confirming the title’s release date. After the initial October 2015 release date was pushed back, Sebastien Loeb Rally Evo will now be available starting January 29. Sebastien Loeb Rally Evo will feature extensive offline- & online modes as well as a career mode. Players will be able to choose from a wide variety of cars from several decades of rally history that can be raced on 250 kilometers of GPS-based stages. Furthermore, the title will not only feature WRC-style point to point rallying but also rally cross, a motorsport discipline rarely found in racing games. 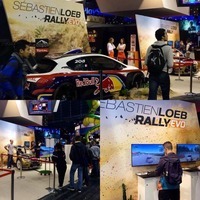 Sebastien Loeb Rally Evo will be available both for the PC as well as Playstation 4 & Xbox One! Milestone has released new previews of their Sebastien Loeb Rally Evo title, showing off the Trois Rivieres rallycross track. Sebastien Loeb Rally Evo will be available starting January 29. The title will feature extensive offline- & online modes as well as a career mode. Players will be able to choose from a wide variety of cars from several decades of rally history that can be raced on 250 kilometers of GPS-based stages. Furthermore, the title will not only feature WRC-style point to point rallying but also rally cross, a motorsport discipline rarely found in racing games. Sebastien Loeb Rally Evo will be available both for the PC as well as Playstation 4 & Xbox One. Milestone has released new previews of two rally cars in their upcoming Sebastien Loeb Rally Evo title. New previews show a current rally car, the Peugeot 208, and classic Group B Ford RS200. The title will feature extensive offline- & online modes as well as a career mode. You will be able to choose from a wide variety of cars from several decades of rally history that can be raced on 250 kilometers of GPS based stages. Sebastien Loeb Rally Evo will not only feature WRC-style rallying but also rally cross, a motorsport discipline rarely found in racing games. Sebastien Loeb Rally Evo will be available both for the PC as well as Playstation 4 & Xbox One.